Haibun is an unusual form, a short prose piece with one or more haiku attached or inserted. It became popular in 17th century Japan, and has a growing number of practitioners here and now. It provides a new perspective, a kind of double glass in which something is seen in two distinct lenses—perhaps scientific and emotional, perhaps mythic and natural—and each perspective enhances the other. 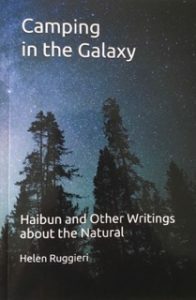 Helen Ruggieri proves to be a master of the form in Camping in the Galaxy, Haibun and Other Writings about the Natural. These pieces are mythic, natural, personal, and scientific all at once. 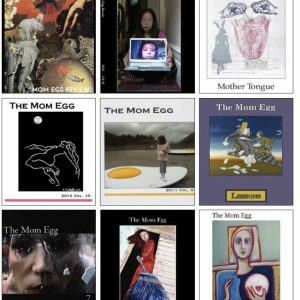 Some are short essays and some are haibun, but they provide an unusual sense of place and interpretation of what it is like to be observer and participant in the world. Ruggieri was born in New Jersey but moved around a lot in early years. 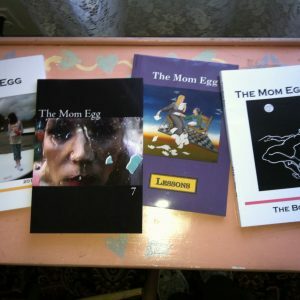 She has written about a dozen books and chapbooks, and won several awards, including a Sasakawa Fellowship from the Nippon Foundation in 2001, the Allen Ginsberg Prize from the William Paterson College of New Jersey, and poetry prizes from the Artists Embassy International and Goose Festival, not to mention many Pushcart nominations. The essay goes on to demonstrate its thesis and suggest alternatives—beautifully and lovingly presented. A major theme of this collection is gardening—all aspects of it—and the specifics of this practice make the reader wish to be also a midwife to the earth’s fruition. Of course as a poet I favor the haibun, enjoying the blend of prose and poetry the mixed-genre form provides. Most of Ruggieri’s are the more traditional variety with a single haiku following a prose paragraph, but some contain more than one haiku as comment and link. Ataensic was looking down through the hole under the roots of the word tree when she fell, dropping and dropping into the void. Below, small friends saw her coming and turtle offered his back and a place for her. Muskrat dove deep for mud and the birds chorused to direct her fall, spinning the winds like a woven net with the magnetic sweep of their wings. And so the world began. This collection gives a strong sense of the land that was, the land that is, and the land that could be. It explores myth and science, overlapping one with the other, using each to illuminate the other. It is definitely a book for the twenty-first century, where the sheer romantic immersion in nature no longer seems realistic to us, although we long for it still. Wood Thrush Books: Swanton, Vermont. 146 pp.